When deciding to undergo facial surgery, you expect specific results, usually consisting of a natural appearance, a reduction of fine lines, and an emphasis on your best facial features. Many plastic surgeons are content performing a variety of procedures, which means that they do not take the additional time to specialize in a single area. Choosing a surgeon like Dr. Calabria, a board-certified surgeon who has spent his career learning and perfecting his facial procedure technique, is the only way to achieve the best possible results. Why a Facial-Specialized Plastic Surgeon? There are many benefits to choosing a facial-specialized plastic surgeon. Offering more than just his overall precision and technique, Dr. Calabria can provide you with a more natural result, tailored carefully to your specific needs and treatment goals. By studying facial procedures so extensively, Dr. Calabria can work precisely when contouring facial features or highlighting facial structures. He has an innate understanding of the face and can provide you with the exact procedures needed to achieve your desired results. He understands which procedures are necessary and will only recommend those that are most appropriate for you. Facial procedures can look unnatural if the surgeon is not skilled in their technique. Dr. Calabria’s experience gives him the ability to work with the intricate features of your face to make any procedure look natural. He understands the subtle contours and the underlying musculature. Dr. Calabria’s experience has led him to develop and perfect numerous facelift techniques. 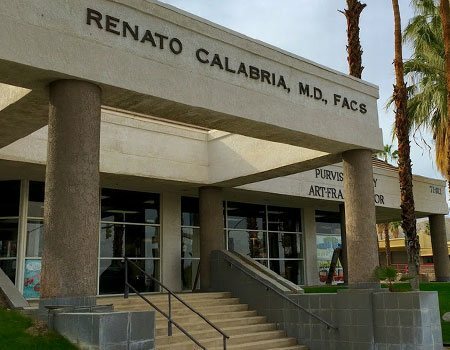 Where most surgeons provide a traditional facelift as part of their repertoire of procedures, Dr. Calabria can offer you the perfect facelift for your needs. The traditional facelift procedure is the most common. The skin is pulled horizontally, but Dr. Calabria’s specialized techniques avoid common side effects of unnatural looking results. Dr. Calabria prefers the vertical facelift procedure. It avoids the common windswept look of a traditional facelift by pulling the skin vertically. This allows tissues to heal faster and gives you a quicker, easier recovery process. The adjustable facelift is similar to a traditional facelift except for the closeness of the incisions. Instead of excising all the excess skin at the end of the procedure, Dr. Calabria leaves the lower layers intact. This means when you come in for a second procedure due to the natural regression of the skin, you have a quicker, less invasive procedure the second time around. Dr. Calabria utilizes your own stem cells, extracted from fat deposits in your thighs, waist, neck, or arms, to restore facial volume. Performed in conjunction with his vertical facelift technique, he injects your stem cells to areas of the face that need additional volume, such as your cheeks or lips. This gives you a much more youthful look than just a facelift would itself. 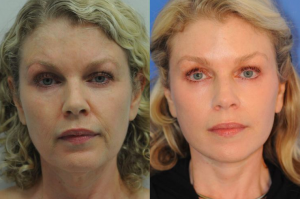 This procedure begins similar to a traditional facelift, but when it comes to suturing, Dr. Calabria takes a different approach. He leaves the lower layers of the skin intact and uses them as suspenders to bear the weight of the skin after the procedure. The suspenders facelift results in a smoother recovery and decreased appearance of scarring. To find out more about which facelift procedure is best for you, please contact our office to schedule your consultation with Dr. Calabria. Our office can be reached at (760) 836-0077.